In this tutorial we will build a simple rss application. 2) when the user clicks on a headline, open the Android browser and redirect to corresponding web page. Note: this tutorial is outdated. I would suggest you follow the new tutorial. The new tutorial is more extended, but it addresses few issues present in this example. On the other hand, if you are not looking for a very detailed tutorial and are interested only in XML parsing part, feel free to browse this example. 2. Add required permissions to AndroidManifest file. 4. Lets create the skeleton of our main activity. Open the SimpleRSSReaderActivity and make it extend ListActivity, instead of Activity as it comes by default. We need this in order to display the headlines in the ListView by binding to an array which will hold our data, using the list view adapter. Add 2 instance variables: “headlines” and “links” of type List. /* We will parse the XML content looking for the "<title>" tag which appears inside the "<item>" tag. * However, we should take in consideration that the rss feed name also is enclosed in a "<title>" tag. * As we know, every feed begins with these lines: "<channel><title>Feed_Name</title>...."
* and take in consideration only "<title>" tag which is a child of "<item>"
* In order to achieve this, we will make use of a boolean variable. getInputStream() is not a standard Java method, so we should create it. This method should take as an argument the feed url, and return the input stream. 7. 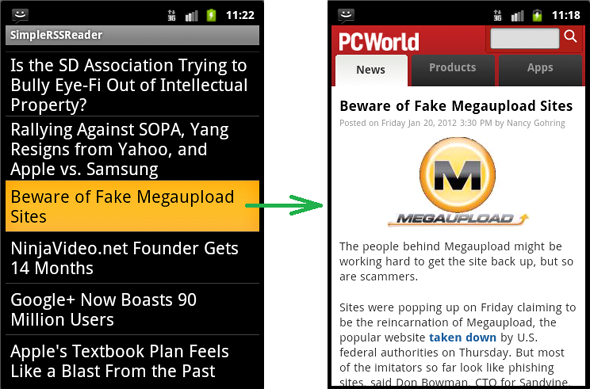 Finnaly, we want when a title is clicked, the Android browser to be opened and display the corresponding article. This one is simple, we override the onListItemClick() method, get the position of article in the ListView, retrieve the coresponding link, and pass the url of that article to ACTION_VIEW intent which takes care further of displaying the web page. Well, if everything went fine and you are done with the simple rss application, the next step to consider is how can you enhance the visual aspect of the application. Adding some style to the ListView, for example alternating between background colors, or displaying an icon next to each headline, can considerably increase the visual aspect, which will make your application look more appealing. Take a look at this tutorial: Building a Custom Fancy ListView in Android, where I show in details how to achieve this. I am following your guide but I have some problems.. I believe the errors that appear in the program are caused by the improper use of quotes. To fix this, manualy change in all equalsIgnoreCase() methods the quotes, from “ ” to ” “. This should fix as well the ERROR 2, and ERROR 3. Later Edit: I see the wordpress does not format the quotes ” ” as they should look. They should look straight, not inclided. i have tried replacing the quotes manually but the issue remain unresolved..
app is running, till i try to open an item. after that the app stopps …. For problem with Uri: change ArrayList headlinks = new ArrayList(); to ArrayList = new ArrayList; and with links do same. I updated one of my previous posts where I was talking about how to detect the internet connection, to include the use of AlertDialogs when there’s no internet connection. can we display headlines and description in a single text box .head lines in bold style and description in normal mode. You will need to create a new List that will store descriptions, just like we store headlines and links. nice tutorial as always !! but how to grap info from xml of this type? I do not understand what you meant. Please explain it, give some more information. i replied with a picture couse the xml code i posted doesnt show. and I suppose in this case you need to read the attributes of those tags, for example DBID, EID, and so on. Personally I did not work with files like this yet, but I saw that XMLPullParse has specific methods to work with, like: getAttributeCount();, getAttributeName(), and getAttributeValue(). However, the topic is interesting, and I’m going to explore it, and eventually writing a post. To solve this problem you should perform the RSS download in a separate thread, AsyncTask can help with this. In this post: https://androidresearch.wordpress.com/2012/03/17/understanding-asynctask-once-and-forever/, I explain how to solve this problem. I implemented the AsyncTask code from your other guide on this project since I’m writing for the latest version of the SDK which requires you to put all network operations like this. When I run the project it doesn’t seem to show anything. I’m not sure if the information isn’t being downloaded, or it’s not binding to the list items correctly, any ideas? Also eclipse is complaining about using the raw type versions of List and ArrayAdapter. Should these be List and ArrayAdapter for generic types? Actually I went through debugging, and the rss feed headlines are definitely being stored in the headline list, just not displaying. Never mind! I figured it out. The method call to populate the header using the adapter (setListAdapter(adapter)) was happening before the background process could download the rss feed. Moving it to the onPostExecute() method of the AsyncTask class sorted it out. I’m glad you figured what’s going on, on your own. @robbiemc : did your RSS app run without the Async class ? Could u help me out and post the PostTask class. Everything between the try and catch clauses went inside the doInBackground method of the AsyncTask class. what do you return ? Nervermind. I figure it out. T.hanks also for the tutorial regarding async tasks. Great tutorial. Glad that you figured it out! How do you guys test your code and what IDE are you using ? You should import their appropriate packages. If you are using Eclipse then go to Source -> Organize imports to automatically import all required classes. Or you may use the CTRL+SHIFT+O shortcut which does the same. Thanks a lot for this tutorial !! you just saved my life! Indeed i had to create this kind of application for my studies… and i had no idea how to do it! Now i understand how to do it and it’s just cool !! thanks a lot for your explanations, they are perfect!!! Yeah, it’s not ok!!! i had problem with this method, alway return null, i am using vitual device for this app, Who any else has solution???? There may be many causes why it crashes, like not declaring the permissions in the AndroidManifest file. But I suppose this is because the SimpleRssReader is trying to perform a network operation from the UI thread. In version 2.2 this was possible, but in later versions this is prohibited. You should use an AsyncTask to access the network and parse the RSS. Make sure your activity extends ListActivity instead of Activity, and import corresponding packages. It does… I’m very confident that I followed along exactly. I’m really not sure what’s going on or why this isn’t working for me. The method parse(String) in the type Uri is not applicable for the arguments (Object)…. Basically this means that Uri.parse() expects a String, but your are giving it an object of another type. Sure, as long as you refer to the original article it’s OK.
As I already stated here in comments, the tutorial was built for Android 2.2 and now is a bit outdated. Starting with Android 3.0 you are no longer allowed to perform network operations on the UI thread. If you do, you get a NetorkOnMainThreadException. You should access the RSS from an AsyncTask. That is why on 2.2 works, but on 4.0 crashes. #1 Here Thx a lot! And its working fine since I wanna play the streamed link in a mediaplayer. My problem now is to bring my URL to the other class and send it into the mediaplaying play button. How can I do it? Is there anyway to store the URL I have taken out from the xml file into getters or something and use it in the other class. I have tried but nothing is working for me. Not sure if I understood your question, but if you want to retrieve the URL from the XML, and then pass it to another method or class, you could put the url into a variable, and then pass that variable to the corresponding method as an argument, or to your class as an argument in constructor. Brilliant tutorial! Works like a charm 🙂 thanks so much! I tried to follow your tutorials but I encountered a runtime exception error that says “Your content must have a ListView who se id attribute is ‘android.R.id.list'”. I’m going nuts even if I changed the ID excactly on what the error said and felt nothing. Thanx a lot for the Post!!! I have a little problm, RSS feed app works perfectly on eclipse simulator , but i can’t run it on my phone , android 4.0 ICS . The tutorial is a bit outdated, starting with Android 3.0 you are no longer allowed to perform network operations on the UI thread. You should access the RSS from an AsyncTask. That is why on 2.3 works, but on 4.0 crashes. hi, i went through your tutorial step by step and found one error while parsing URL to string…Can u please help me out with this? Please update the Tutorial for the latest version of Android. Thank you A LOT friend!! I am new to this so sorry for the stupid question, but when you say “Open the SimpleRSSReaderActivity”, how do I do this? I see, so you parse toString? The problem I have is specifically this line. return type for method is missing and adapter cannot be resolved to a type. Please help thanks. List cannot be resolved a type. Multiple markers at this line. List cannot be resolved a type. ArrayList cannot be resolved a type. XmlPullParserFactory factory cannot be resolved a type. please help. i am new to android development. what are the classes i have to import? for your 1st and 2nd query …. at the red mark it will give you suggestion and import need lib for type(mostly that will be your 1st suggestion in given list). Try This mostly u can solve it by this option. i have used source organized imports. some Errors cleared. As the error says, the method accepts a String but you are passing to it an Object. You would need to cast that object to String. I have imported project well in my eclipse and also deploying on the same on my mobile HTC explorer android 2.3 but the install file when try to open i m getting error “Applcation RSSFeeder stopped un-expectedly “…plz help me to sort out this…. Hello, I’m actually using this code to parse the RSS from a website, everything works except that I can’t read descripcion, author o date, only title and link, can it be solved? I am using the code as given and the app crashes every single time. Any idea to work around? You have a “NetworkOnMainThreadException” because are trying to perform network operations from the UI thread. To fix it, that piece of code which access the network to download the rss feed should run in a separate thread. There this problem is taken in consideration by performing the network operations from an IntentSevice. I have one question here..
How to read the complete description ??? Where the fallowing app in google play is able to read it. I am not sure how. Thanks, and i show someone how to do it ? about a whole lot about this! Im stuck with the uri parse stuff someone please give an proper detail on how to solve the error…..
Great Article exactly what I needed. Anyone who owns a website/blog can create a simple app that will pull own rss feeds from the site. This way you can popularize your site on Android phones. Now! Make your own RSS android app. Perform the network operations on a separate thread. As stated in the beginning of this blog post, this post is deprecated in favor of this one: https://androidresearch.wordpress.com/2013/06/01/creating-a-simple-rss-application-in-android-v2/ where the issue with running on devices with 3.0 and above is taken in consideration. Good tutorial. I saw some errors, excuseme my english is poor. I don’t get any errors in the code, but when I try to launch it, it crashes. 1) Don’t write network call in Main UI Thread, Use Async Task for that. got this type of errors please help me asap. I just want to create a app to display news of my work. The news should be updatable everyday by me. How can i create such app? Not connect to website ? only read list RSS in main.xlm only ? why Mr ? Warning:Project is building density based multiple APKs but using tools version 19, you should upgrade to build-tools 21 or above to ensure proper packaging of resources. how to filter the feeds by keyword? In you xml, how to get “” and ” tag which is a child of “” ?? How can i ger url attribute from enclosure in your feeds?